One of the criticisms of NASA’s Space Launch System (SLS) has been the lack of science missions planned for the super-heavy-lift launch vehicle. On Tuesday, Feb. 2, NASA worked to address those concerns with the announcement of the Science and Technology missions that have been chosen for the first SLS flight – Exploration Mission 1 (EM-1). As well as an uncrewed Orion spacecraft, the inaugural flight in 2018 of NASA’s new rocket, the Space Launch System (SLS), will have on board 13 CubeSats to test out innovative ideas. These secondary payloads of CubeSats will conduct science and technology investigations of deep space and serve as pathfinders for future human exploration in journeys to Mars and beyond. The first flight of the SLS, EM-1, will provide a rare opportunity for sending these small experiments toward destinations in deep space because most launch opportunities for CubeSats are restricted to low-Earth orbit. The SLS is NASA’s next generation launch vehicle. It is derived from a combination of legacy hardware designs from the Space Shuttle era and new technologies created to increase safety and reliability. The system is composed of two solid boosters and a new liquid hydrogen/liquid oxygen core that uses 4 RS-25 engines – the same engines used on the shuttle orbiters. The SLS can launch the Orion space capsule into Earth orbit, cislunar space, or send payloads to Mars and beyond. 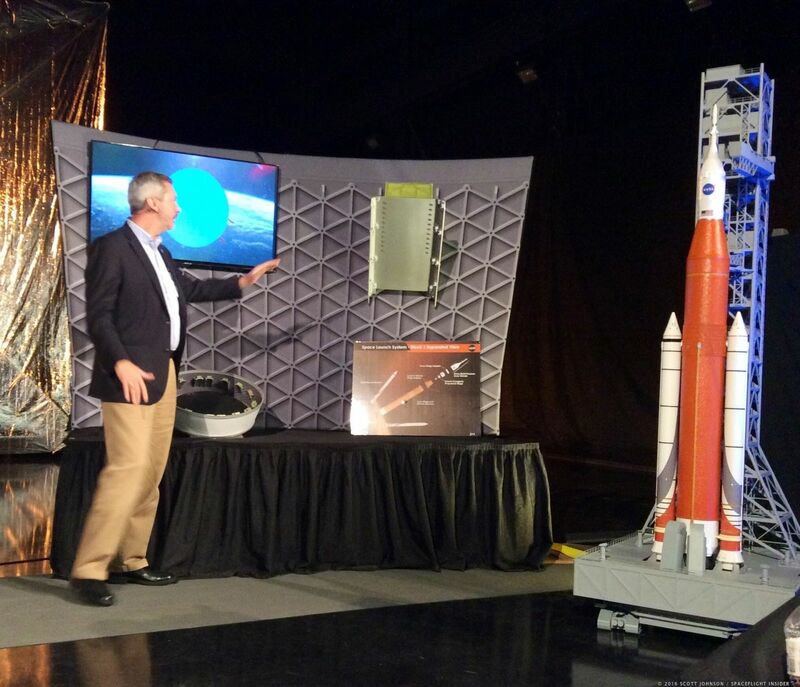 The secondary payloads announced at the event are CubeSats – small form factor satellites that pack a lot of science into a very small space. They were chosen via announcements of flight opportunities, a public contest and through negotiations with NASA partners. One of the announced missions is NEA Scout (Near-Earth Asteroid Scout) – a CubeSat that will use solar sail propulsion to reach a near-Earth asteroid. This CubeSat will demonstrate the solar sail capabilities as well as take measurements of the asteroid for future manned missions. Skyfire – Lockheed Martin Space Systems Company, Denver, Colorado, will develop a CubeSat to perform a lunar flyby of the Moon, taking sensor data during the flyby to enhance our knowledge of the lunar surface. Lunar IceCube – Morehead State University, Kentucky, will build a CubeSat to search for water ice and other resources at a low orbit of only 62 miles above the surface of the Moon. Near-Earth Asteroid Scout, or NEA Scout, will perform reconnaissance of an asteroid, take pictures, and observe its position in space. BioSentinel will use yeast to detect, measure, and compare the impact of deep space radiation on living organisms over long durations in deep space. Lunar Flashlight will look for ice deposits and identify locations where resources may be extracted from the lunar surface. CuSP – a “space weather station” to measure particles and magnetic fields in space, testing practicality for a network of stations to monitor space weather. LunaH-Map will map hydrogen within craters and other permanently shadowed regions throughout the Moon’s south pole. The primary goal of the first integrated launch of the SLS will be to demonstrate the capability of the SLS/Orion system to launch future crewed missions. NASA plans to use the SLS for missions beyond low-Earth orbit including a near asteroid mission. Eventually, the agency plans to use SLS and Orion for the long trek to Mars and back. I have been feeling fed up with the SLS because it has been taking resources away from science and exploration missions – which NASA is stunningly good at. These proposals look really exciting though, and will go a long way to vindicating the whole SLS project. Why not fly these payloads on other rockets??? What is cost of the rocket in relation to the cost of the cube stats? How much weight are the cube stats? Is like building a 18 wheeler and the first flight has a 5 lb bag of sugar and mentioning science in the same sentence – kind of funny but it is not. Its a sledge hammer to crack a nut sure enough, but at least its a step in the right direction.